Most hams use more than one antenna for HF operation. When operating HF remote, it is important to be able to remotely switch from one antenna to another for optimum performance. I have four antennas and a dummy load connected to a LDG DTS-6 switch. This switch, and the companion DTS-4, were designed to be operated remotely using the DTS-R remote module. The switches can also be operated from the serial port of a computer but the company never got around to writing the necessary software. However, they did provide the command set for the switch and I incorporated the commands into the programming for the Picaxe microcontroller I use for my station control. One feature of the Picaxe microcontroller that I found most useful for operating the DTS-6 was the ability to convert serial signals from the computer to the TTL signals required by the DTS-6. When I programmed the Picaxe chip for my project, I selected 8 terminals which can control 12VDC relays to turn on and off station accessories in addition to the TTL output to the DTS-6 switch. On the microcontroller page I have included the instructions for building the circuit board necessary for operating the relay switching and DTS-6 control using the Picaxe chip. Also included are instructions and the command file for programming the chip once installed on the board. 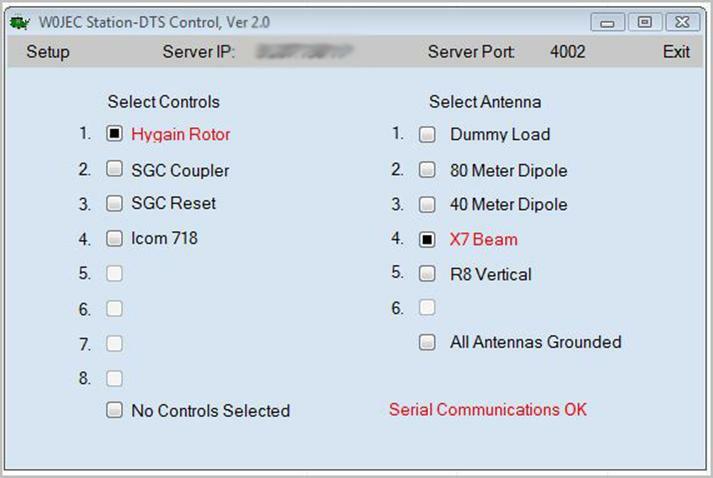 There are other possibilities for remote antenna switching if you don’t have, or can’t obtain, the LDG DTS-6 or DTS-4 switch. The Picaxe microcontroller can be programmed to switch up to thirteen 12VDC relays and with careful programming a set of relays can be designated for antenna switching. Within the antenna switching set, the microcontroller can be programmed to turn on only one relay at a time, with all other relays off, to isolate the single antenna needed for each band. The remainder of the relays can be used to turn on and off other station accessories. I have included a schematic and Picaxe command file for such an antenna switching/station control project on the microcontroller page. There are other relay boards on the market that are suitable for antenna switching and which can accept TTL commands for control. The Picaxe chip is also capable of controlling these boards and the projects I have provided can be modified according. Since the Picaxe chip is connected only to the home computer and requires additional software to send commands and data to and from the chip, I wrote the software W0JEC Station-DTS Control using Visual Basic 2010. I wrote the software to include up to 6 antenna selections and 8 station control accessories. The program will only allow one antenna to be selected at a time (for obvious reasons!) but all of the stations accessories can be turned on and off at will. This software controls the Pacaxe chip through a serial port on the home computer. When installed on the remote computer, the software is connected to the selected serial port of the home computer through the use of W0JEC Server and the LogMeIn Hamachi² software on the home computer. Detailed instructions for setting up and operating this software can be found on the Station Control page.